I like to go for a walk in the evening .Have a drink at a bar and watch the world go by.Is there much to do in the surround area. Restaurants/bars etc. are there any recommendations for hotels in kalamaki good for people with mobility problems? We are booked for the bitzaro palace in may and my parents would like to book as well but are worried by the steps to the front entrance and stepping into the bath to take a shower. My boyfriend and I booked to go to the Bitzaro Grande over 2 months ago with Thomas Cook and have today, just over a week before we go, been told that the hotel has over allocated it's rooms and we've been moved to the Bitzaro Palace!! It would seem from reading the reviews on this website that it seems that this hotel chain does this regularly. When I questioned Thomas Cook about this today, it apparently does happen quite often and is in the small print of the booking terms and conditions. Funny how the travel agent points out the smallest detail regarding the terms and conditions e.g. about making sure you let them know you've arranged your own travel insurance, but fail to mention that you could find out about a week before you travel that your hotel could change!! What's the point in pre-booking, rather than going for a late deal??! Stayed here again from 3-17th September 09. Warm welcome from wonderful staff. Excellent atmosphere, friendly but not in your face. Pool and surrounding area and garden lovely to relax in, and is peaceful and relatively quiet with no musak! Meals were nicely presented with a variety of choices to suit most tastes. Rooms cleaned to a high standard each day by very friendly cleaners. Altogether a very clean and comfortable place to stay. hello,the wife and i stayed at the bitzaro palace last june for my 50th and we had a superb time.the hotel is great,location,pool,staff,etc etc.the old strip in kalamaki is lovely,enough place to eat and drink and the newer srtip if you want things a bit lively.if you want a nice hotel set in peaceful surroundings then this hotel is just the job.ps mark,the grande is just across the road.check out this site and it shows you the locations on a map ok.sorry did not notice the gym so no comment,i run but used the country lanes and enjoyed the scenery. (http:/www.justzante.co.uk) if i can help any more just ask ok mate,bye. Hello to all at Bitzaro Palace - this place is out of this world, stayed here a few years a go!! Does anybody know if Sammy still works here?? He normally worked at night. My other half and I stayed at the hotel during the first week in August this year. The place was nice, the food was good and the staff were very friendly and helpful. The planes flying overhead were quite loud at times, but this was quite infrequent and only on certain days, it seemed. The only downside was the air-conditioning in the room. Some nights were very hot outside but the A/C wasn't very good, consisting of a vent/fan that circulated warm air around the room. However, I would definitely recommend the hotel. hi leah, i have just got back from the bitzaro palace and when i arrived it was over booked, if she is going with Libra good look. when this happened to me they didnt come out to sort it, infact the receptionist moved things around so there was space. but if she is staying in the grand it is a lovely hotel and there are plenty of rooms im positive she will have a great holiday and wil have no worrys. I was wondering if anybody could help me, My daugthter is going on her honneymoon to the Bitzaro Grand hotel in Kalamaki in late September this year. Now having read the comments about the hotel from one of its other guests, the hotel is often over booked. How can I make sure that she dose have a room that she has booked with the majority of her savings? I dont want her honeymoon ruined because of a mistake. Can anyone put my mind at rest? Can anybody tell me please if Sammy still works here, he use to work the later shift, he was lovely. Just returned from one week stay at superb resort hotel. Could not fault the place. Great staff and fab pool. We went B&B which was ok so that we could try all the Tavernas. Amaryllis at the top of the road is wonderful (swordfish souvlaki). Trip round the Island worthwhile. Loved it so much that we will be back for 2 weeks next year! We went to the Bitzaro palace from 1st - 15th July this year. The hotel is fanastic. The pool area is good no problems in getting a sun lounger, a word of caution for kids the pool is quite deep even at the shallow end. The hotel staff are fantastic, from the receptionist to the cleaners they always have a smile on their faces. Special mention has to go to Nikos and wife in the restuarant and Panos in the bar. The food throughout the day is good, although for evening meals they don't really cater for kids. The reports of this hotel said "some aircraft noise", i thought thats nothing as i live under the Manchester Airport flight path, but the airport runway is approx 2 miles away from the hotel and the planes descend right over the hotel. This can be loud! Although there isn't a lot of planes landing each day. I'd highly recommend this hotel. I wasn't impressed with Kalamaki as a resort, it's too much of a purpose built resort, along the main strip all you pass is bars, restuarants, supermarkets and tourist shops, although there may be the odd car rental or jewellery shop. There is no culture to the place. Although we really enjoyed our holiday i wouldn't go back to Kalamaki - If only the hotel was in a different location. Me n my partner av jst got back from our 1st holiday together n we couldn't av chosen a better place to go! Everything about the hotal is exceptional. The rooms are spotless n r cleaned everyday, the towles n bedding r changed every 2nd day n the staff are always friendly and helpful. Nothing is 2 much trouble for them. The pool area is excellent 2 n there are plenty of sunbeds.The breakfast buffet has something 4 every1 n is always fresh. The snack bar throughout the day is great 2 n very well priced! The situation of the hotel is also excellent. 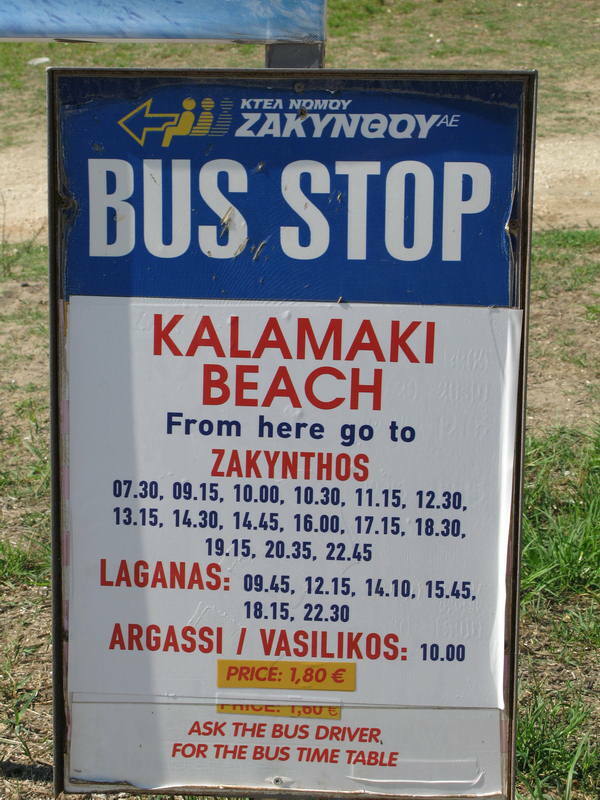 A 5 min walk up to the main road of Kalamaki, a 10 min walk to the beach n a 5 min taxi ride to Laganas. My only complaint would av to be is that we only spent 1 week there! We've just got back from two great weeks at the Bitzaro Palace Hotel. The rooms are spotless and cleaned every day. The breakfast really sets you up for a day of lazing by the pool or on the beach. The snacks are very good and well priced. Panos runs the bar and always has a smile and a cold drink ready for you. The hotel is quiet and very relaxing but if you want more excitement the beach and bars are only 5 minutes away. Thoroughly recommend this hotel and we will be going back soon. We're travelling to the Bitzaro Palace on 1 July 04 - anyone been recently, any tips? Apart from the pool is there much to keep 3yr old occupied throughout the day? You've made a very good choice choosing the Bitzaro Palace, its a stunning Hotel, i went last year in July, i am 18 i went with my Parents, its quiet so you can relax by the pool and catch some rays the beach is about 5/10 mins walk but its a nice beach. If you want a bit on night life get a taxi and ask them to take you to Downunder bar (always agree the price before you get in the taxi because its been known for them to get a bit nasty i would say about 4/5 euro but no more), as there are lots of bars restaurants etc... everyone is so friendly, ive got friends that work in a few bars/ restaurants. If i dont speak to you, i hope you both have a lovely wedding and a fab Honeymoon. Congratulations.